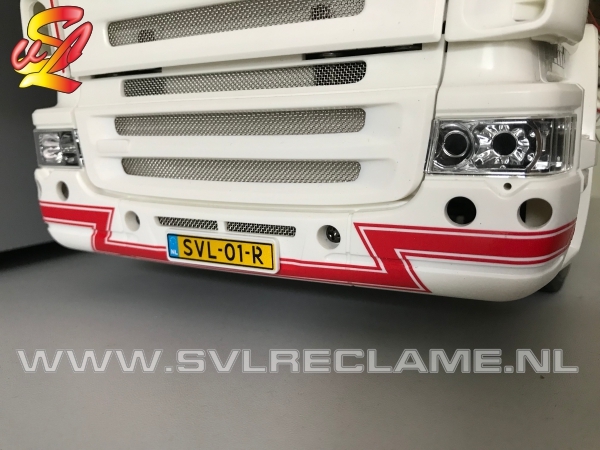 Sander van Leeuwen RC Parts and Decals, Sign, Scale Modelling and Paint. 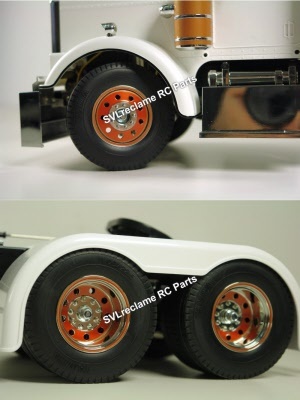 Decals and parts for Tamiya 1/14 RC Trucks, Diecast and Scale Modelling. We ship worldwide. 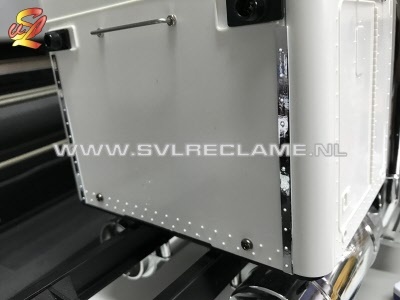 If you need assistance, have questions or have difficulty translating send us an e-mail to info@svlreclame.nl and we assist you with your purchase. Choose your language in the top right of the screen. Wählen Sie Ihre Sprache oben rechts auf dem Bildschirm. Kies uw gewenste taal rechtsboven in de hoek, (de Nederlandse vertaling word momenteel toegevoegd aan de webshop). 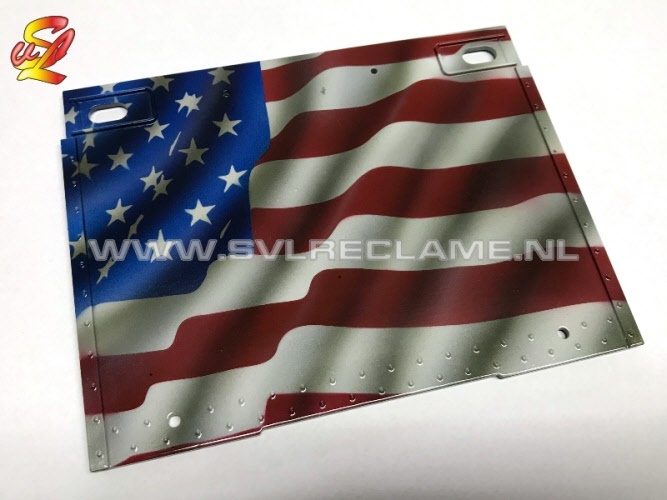 These rear plates are airbrushed by hand, and therefore can have a slightly different appearance then on the picture since no plate will be exactly the same. Painted with: AutoAir Colours and professional 2K Clear Coat. Must be glued in place. Glue not included. Shown in Brown Caramel with Beige Stripes and Text. Base colour show in light sand, contrast stripe in red. These curtains must be glued in place. 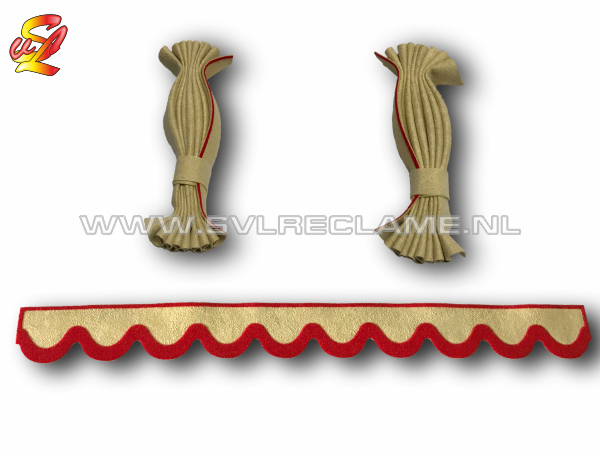 Front curtain can be made with 10 round or 10 square flaps. 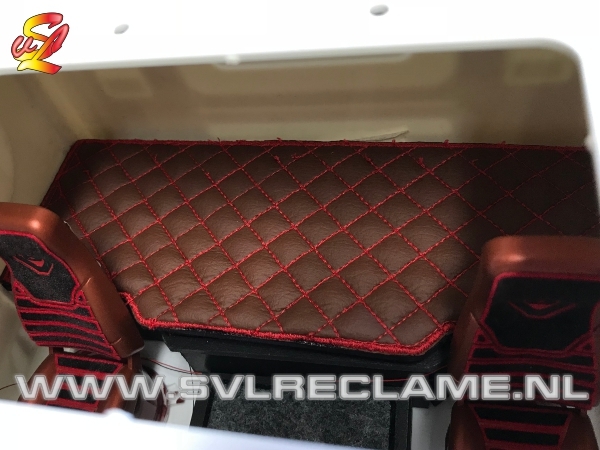 Handmade interior kit with diamond stitching. 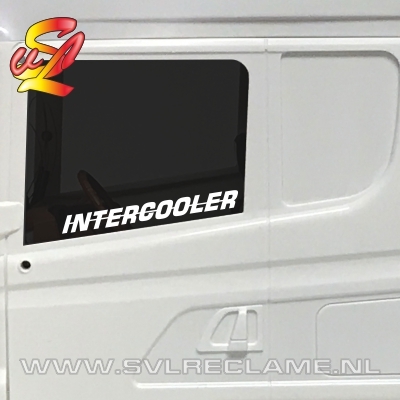 We dont have pictures yet of the Doorpanels, Roof Side Panels, Roof Panel and Floor cover. These will come as soon as possible. Seats and Dashboard not included. Enter the desired colour for the Text. Rear is Black. This decal goes round the window and runs over the front of the Truck. This set contains one left and one right decal. 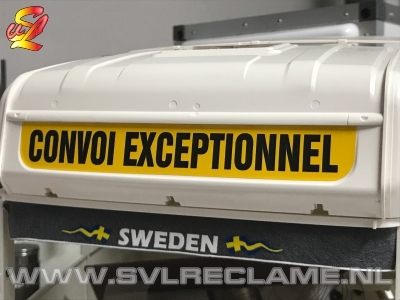 CONVOI EXCEPTIONNEL decal for the Verkerk Topline Roof of the Tamiya Scania. Set of one left and one right decal. Enter the colour you want. 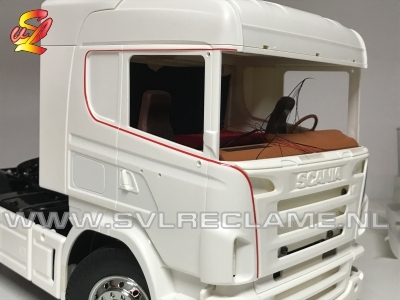 Set of one left and one right decal for Tamiya Scania 1/14 RC Truck. - Middle Colour shown is Red. - Inside Colour shown is Black. Set of 2 decals for the side windows. Choose cutting style, normal for applying outside or mirrored for applying inside of the window. 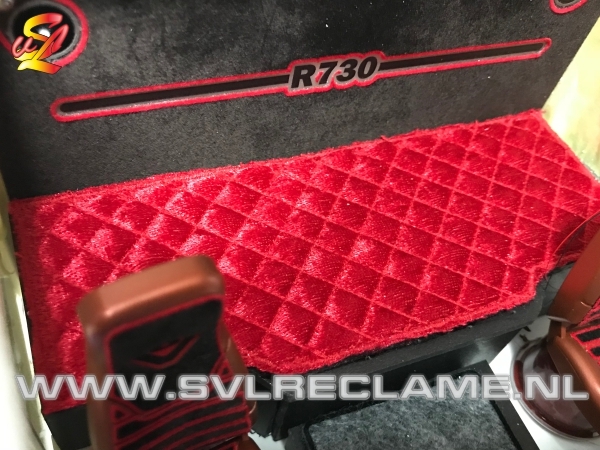 Set of floor mats, made of artificial leather. Has a diamond stitch pattern. Choose your desired colour combination. Sleeping Bed with Diamond Stitch. Made of artificial leather. Set of 2 Doorpanels. (Contains one left and one right). You need to glue these in place. or use double sided tape (not included). Choose the colours you want. 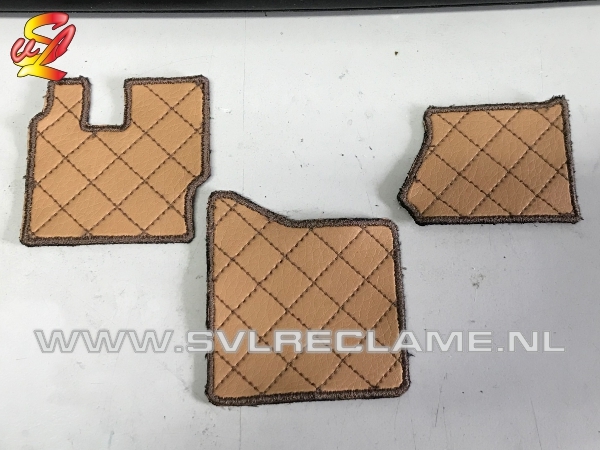 The Leather that is used for these panels is artificial leather. 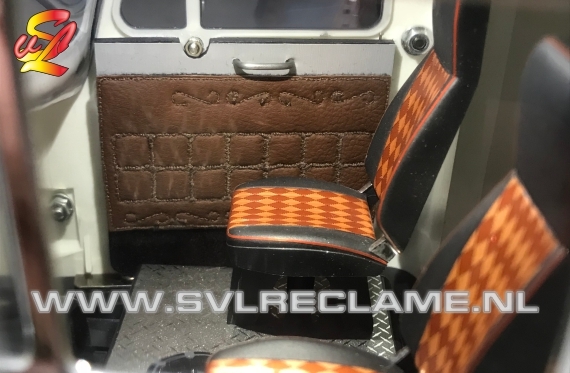 Hyper realistic dashboard in scale 1/14. Choose the colour you want for the lighting. Set of 2 trailer poles. Select length to see the price. Enter length of the poles (A). 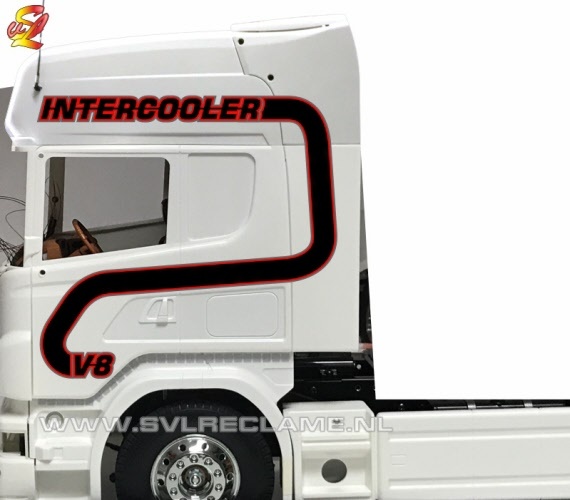 Enter the length in mm from point 1 (your trailer chassis) to point 2 (front end of the reflective poles). Note: this length is the length of the pole that is vertical in the picture and width of the pole that is horizontal in the picture combined. 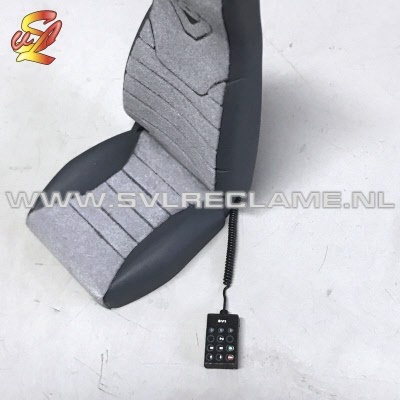 A new dashboard part is included in the price. 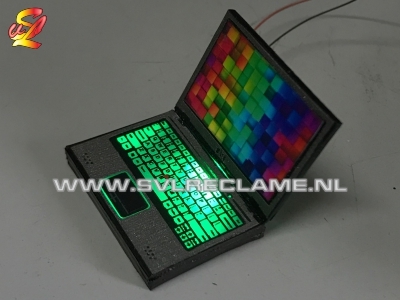 Important Note: you can choose white LEDs with any "Radio and button colour". If you want Red, Green or Blue LEDs you must choose the same colour for "Radio and button colour". 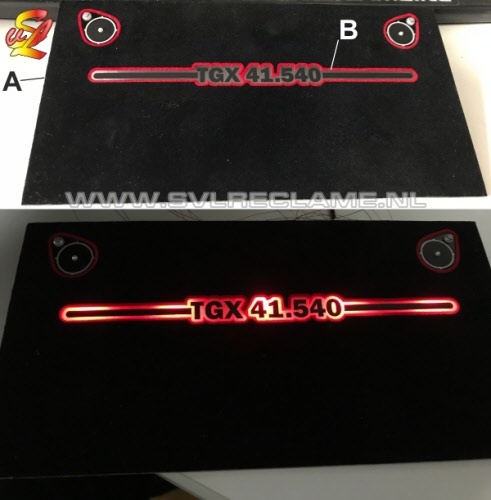 (For example it is not possible to light up a green "Radio and button colour" with a red led because the decal acts as a filter). Leds work with 7 to 12 volt power supplies. This wiremesh kit fits the original Tamiya Grill and there is also a piece included for the sidefender. Needs to be glued in place. Glue not included. Choose if you want normal or fine mesh. set of 2 side poles for the front bumper of the Grand Hauler. You need to drill 2 holes of 3.2 mm in the bumper. Note: The poles have a slight angle when they are mounted because the inside of the bumper has a slight slope. When the poles are installed they are slightly hanging forward. You can adjust this by bending the thread a bit. (DO NOT BEND THE THREAD WHEN THEY ARE ON THE BUMPER). Satz von 2 Seitenstangen für die vordere Stoßstange des Grand Hauler. Sie müssen 2 Löcher von 3,2 mm in den Stoßfänger bohren. Hinweis: Die Stangen haben einen leichten Winkel, wenn sie montiert werden, da die Innenseite der Stoßstange leicht geneigt ist. Wenn die Masten installiert sind, hängen sie leicht nach vorne. Sie können dies anpassen, indem Sie den Thread ein wenig biegen. (DEN GEWINDE NICHT BIEGEN, WENN SIE AUF DEM STOSSFÄNGER SIND). 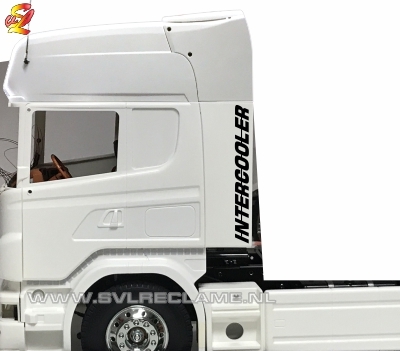 Curtains in scale 1/14 for Tamiya, Wedico or Bruder RC Trucks with Zig Zag Accent. Shown curtain colour is white, curtain has a dutch flag on the bottom. 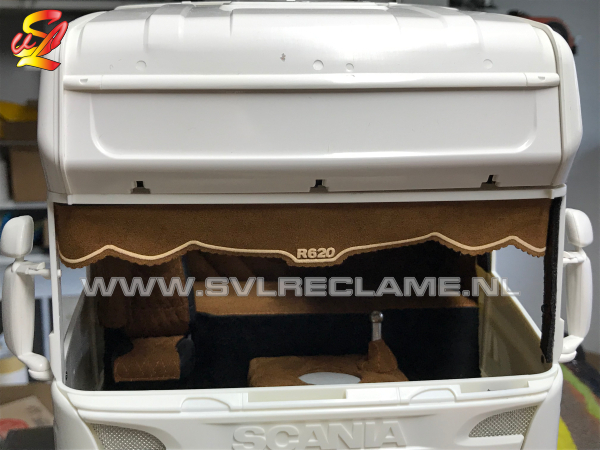 Curtains need to be glued to inside of the truck cabin. painted and fully finished for installation. Simply choose the colour combo you want. 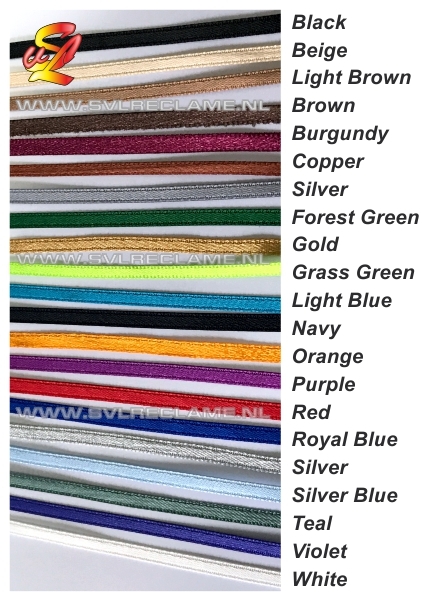 Choose from 21 colours for the seatbelt. lackiert und fertig für die Installation. Wählen Sie einfach die gewünschte Farbkombination aus. 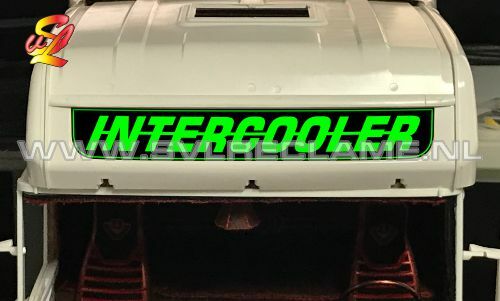 Made of 3M reflective vinyl. Has Chrome printed screws for a very realistic look. 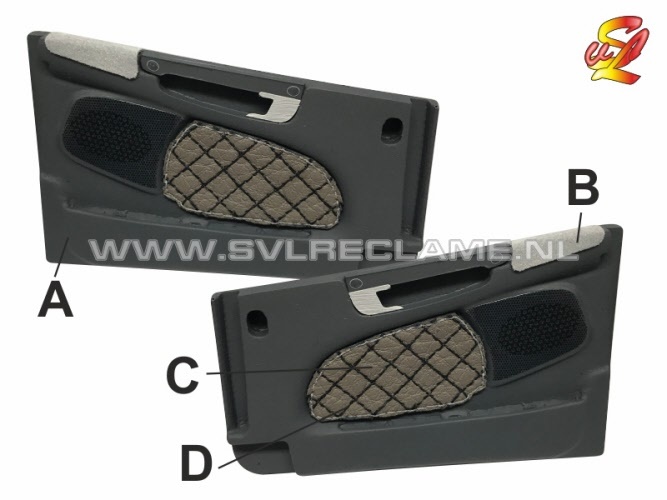 Select the size you want, 10 mm or 13 mm high. Need other size? contact us. D) Hergestellt aus 3M reflektierendem Vinyl. Hat Chrome gedruckte Schrauben für ein sehr realistisches Aussehen. Wählen Sie die gewünschte Größe, 10 mm oder 13 mm hoch. Brauchen Sie eine andere Größe? kontaktiere uns. One set contains one left and one right decal. These chevron markings are used when a cargo is sticking out in the front, more than 10 cm in widht, or more than one metre on the rear. 4 Pieces of 30 cm length, select desired width and colour. Need a matching colour for your project? Please contact us for custom colours and pricing. D) 4 Stück von 30 cm Länge, gewünschte Breite und Farbe auswählen. Brauchen Sie eine passende Farbe für Ihr Projekt? Bitte kontaktieren Sie uns für benutzerdefinierte Farben und Preise. Set contains 8 wood decals and 2 anti skid decals. 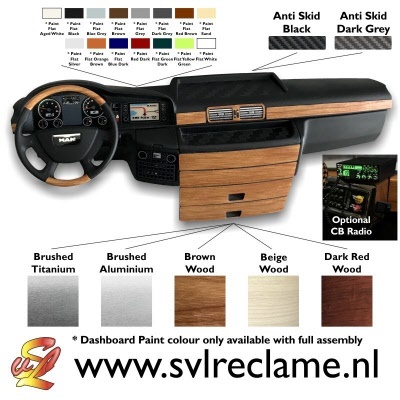 Choose from Beige, Brown or Dark Red for wood colour and Black or Grey for Anti skid. Needs to be applied with minor heat to form to surface. 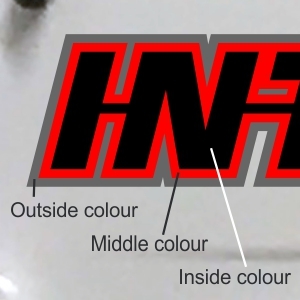 Damage to paint or plastic parts due to excessive use of heat or damage due to poor paintjob of surface to apply decal on are at your own risk. D) Set enthält 8 Holztafeln und 2 Anti-Rutsch-Aufkleber. Wählen Sie zwischen Beige, Braun oder Dunkelrot für Holzfarbe und Schwarz oder Grau für Anti-Rutsch. Muss mit geringer Hitze aufgetragen werden, um auf der Oberfläche zu bilden. Schäden an Farbe oder Kunststoffteilen durch übermäßige Hitzeeinwirkung oder Schäden durch schlechtes Anstreichen der Oberfläche, auf die das Abziehbild aufgetragen wird, geschieht auf eigene Gefahr. With Hi-Lo selector and shift pattern on the knob. easy installation: fit optional round decal on the floor, this decal has a hole that marks where to drill the 3 mm hole. Drill the hole, put the thread through the hole and tighten nut. Mit Hi-Lo-Wahlschalter und Schaltmuster am Knopf. einfache installation: optionales rundes aufkleber auf den boden passen, dieses aufkleber hat ein loch, das markiert, wo das 3 mm loch zu bohren. Bohren Sie das Loch, führen Sie den Faden durch das Loch und ziehen Sie die Mutter fest. 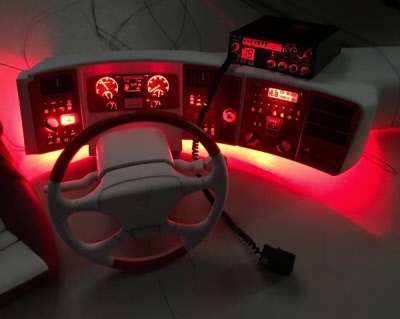 Fully Hand built CB Radio, choose the lighting colour you want. Use only on 7 to 12 Volt. Please respect building time for this item. 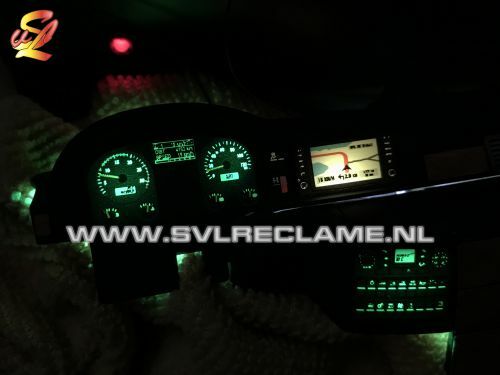 Komplett handgebautes CB Radio, wählen Sie die gewünschte Lichtfarbe. Verwenden Sie nur bei 7 bis 12 Volt. Bitte beachten Sie die Bauzeit für diesen Artikel. One set is for left and right. Set enthält ein rechtes und ein linkes Selbkleber. This decal set makes your steering wheel look like it is made of a chain. 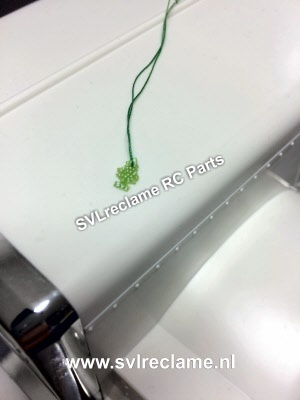 Set contains: - chain decal, 3 spoke decals and 2 horn decals. Shown is Chrome, but also available in Silver Metallic, Gold Metallic and Mirror Gold. 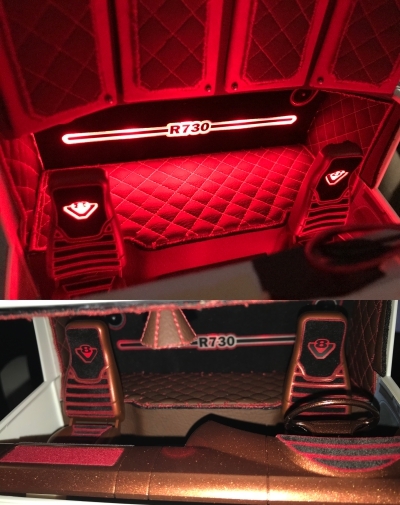 This decal set makes your steering wheel look like it is wrapped with leather. 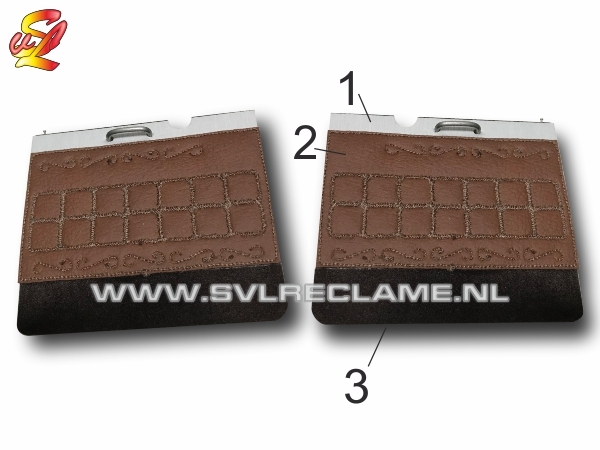 Set contains: - leather decal, 3 spoke decals and 2 horn decals. Shown is Chrome, but also available in Silver Metallic, Gold Metallic and Mirror Gold. comes with installed green cord, long enough to cut to your needed length. After cutting to your length make a knot and cut excess material. Check if this size fits your truck before ordering. Set of 6 rim decals for Carson Wheels. Price is for colours we stock. 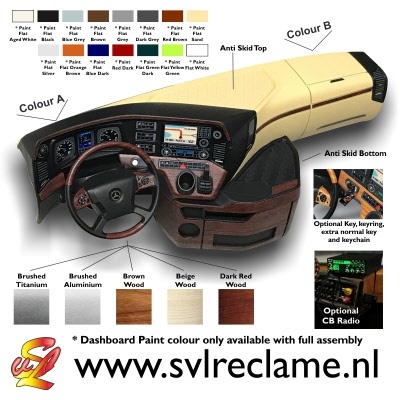 If you want a specific colour, contact us before ordering to check if we can make that colour. WARNING: Can not be removed afterwards, chrome will be damaged. Use at your own risk. Be carefull when applying to not damage the Chrome, the Chrome is fragile. We only recommend applying with wet technique. Set van 6 stickers. (4 stuks voor de achtervelgen en 2 stuks voor de voorvelgen.) 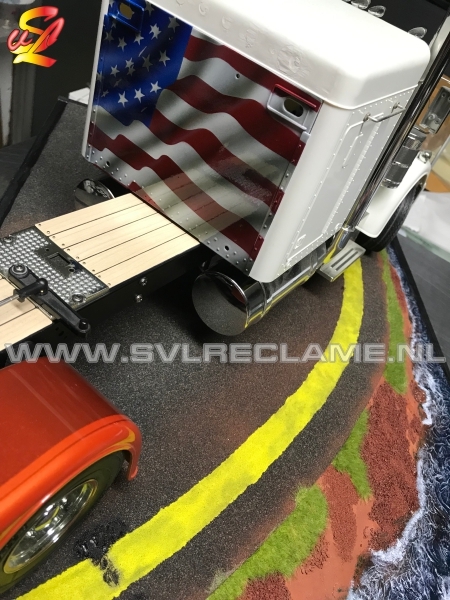 Uitgevoerd in 2 kleuren. (afgebeeld zijn 2 kleuren). Deze stickers zijn exact op de juiste maat gemaakt zodat de montage heel eenvoudig is. 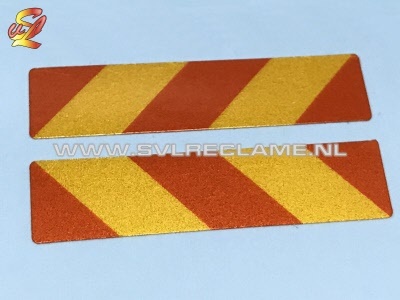 Nu is het mogelijk om de velgen in uw favoriete kleur te maken en tegelijkertijd het chroom te behouden. De lijnen zijn superstrak, geen getob met afplakken en spuiten meer, gewoon eenvoudig de stickers monteren. 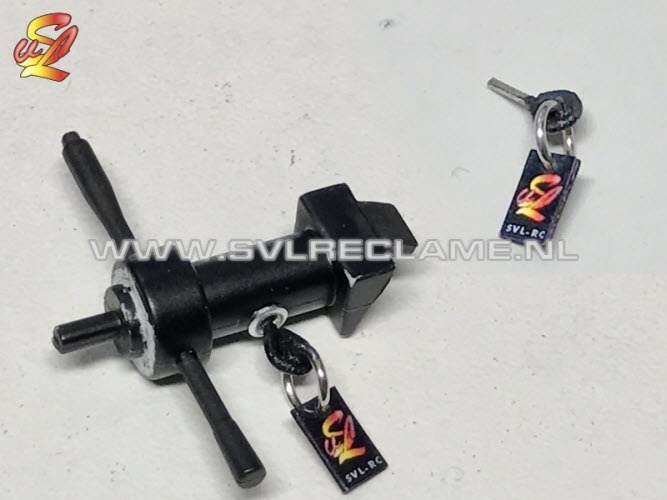 Wij adviseren om deze set nat te plakken met water en zeep. 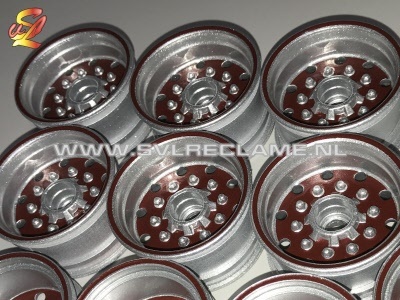 Decal set of 6 pieces in 2 colours (4 for the rear wheels and 2 for the front wheels). Fits the stock rims of the Tamiya Grand Hauler. Stickers fit exactly over the holes for easy fitment. Now you can have your favorite colour wheels and have the chrome at the same time. Lines are very smooth, no hassle with masking and painting, just peal and stick. We advise to mount this decal set with water and soap. 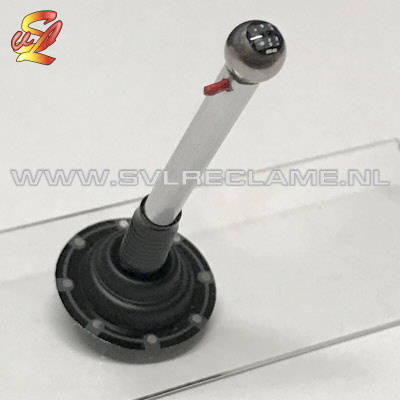 Steering Column part is not included. You are only buying ignition switch, key and keychain. You can choose the colour of the ring of the ignition switch. Choose from black, Gold or Silver. Drill hole to to accept the ignition switch and glue ring and key in place. Decoration part only, it is not a functioning ignition switch.